Bu çalışmada İşyerinde Mizah Yoluyla Başa Çıkma Ölçeği’nin Türkçe’ye uyarlama, güvenilirlik ve geçerlilik çalışmaları yapılmıştır. Öncelikle, Türkçe’ye çevrilen Ölçek maddeleri İngiliz dili uzmanları tarafından değerlendirilmiştir ve öneriler doğrultusunda gerekli düzenlemeler yapılmıştır. Ardından, Türkiye’de hizmet sektöründe çalışmakta olan 403 beyaz yakalı çalışandan veri toplanmıştır. Sonuçlara göre, Ölçek hem bir bütün olarak hem alt boyutları kapsamında yüksek bir iç tutarlılık katsayısına sahiptir. Doğrulayıcı faktör analizi, Ölçeğin hem dört boyutlu yapısını hem tek boyutlu yapısını desteklemiştir. Ölçekten elde edilen puanlarla, iki benzer ölçekten (Mizah Yoluyla Başa Çıkma Ölçeği ve Mizah Tarzları Ölçeği) elde edilen puanlar arasındaki korelasyon katsayıları ölçeğin ölçüt geçerliliğinin bulunduğunu göstermiştir. Bu araştırmanın sonuçları İşyerinde Mizah Yoluyla Başa Çıkma Ölçeği’nin güvenilir ve geçerli olduğunu göstermektedir; ancak Ölçek Türkçe’ye yeni kazandırılmış olduğundan, farklı örneklem gruplarında yeniden test edilmesi önerilmiştir. Ayrıca Ölçeğin alt boyutları ile farklı mizah tarzları arasındaki korelasyon katsayıları ışığında Tartışma bölümünde değerlendirmeler yapılmış, gelecek araştırmalar için önerilerde bulunulmuştur. 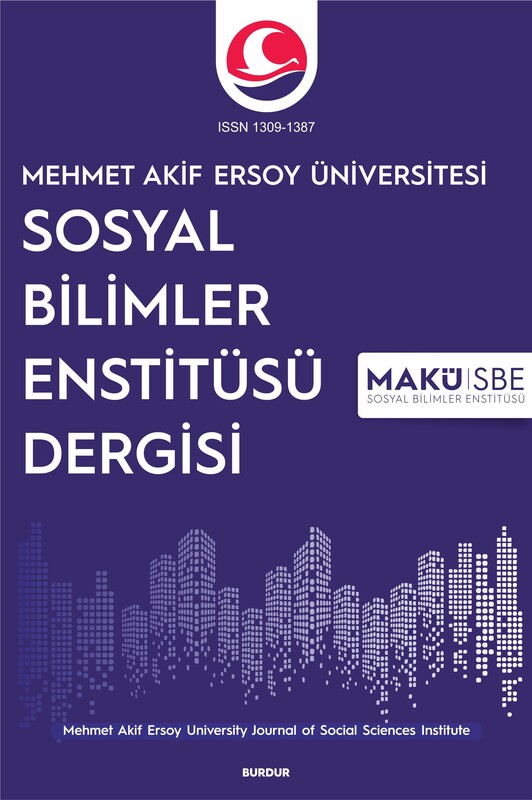 The purpose of this research is to adapt Questionnaire of Occupational Humorous Coping into Turkish and study the psychometrical features of the Turkish form of the questionnaire. Primarily, items translated into Turkish were evaluated by English language experts and necessary modifications were made according to the suggestions. Afterwards, data were collected from 403 white-collar employees working in the service sector in Turkey. According to the results, the scale –as a whole and with sub-dimensions- has a high internal consistency. Confirmatory factor analysis supported both the four-dimensional structure and the one-dimensional structure of the Scale. The high correlations between scores obtained from the Turkish form of Questionnaire of Occupational Humorous Coping and two similar scales (Coping Humor Scale and Humor Style Scale) showed that the scale has a criterion validity. The results of this study showed that the Questionnaire of Occupational Humorous Coping is a valid and reliable instrument, however, since the scale is newly acquired to Turkish, it is suggested to be retested in different sample groups. Additionally, in the light of correlations between the sub-dimensions of the scale and different types of humor, evaluations and suggestions for future research were made in the discussion section. Abel, M. H. (2002). Humor, Stress and Coping Strategies. Humor: International Journal of Humor Research, 15(4), 365-381. Barsoux, J. (1996). Why Organizations Need Humor. European Management Journal, 14(5), 500-508. Bentler, P. M. (1980). Multivariate Analysis With Latent Variables: Causal Modeling. Annual Review of Psychology, 31, 419-456. Bollen, K. A. (1989). Structural Equations with Latent Variables. New York, NY. Bowers, L. (2003). Manipulation: Description, Identification and Ambiguity. Journal of Psychiatric Nursing and Mental Health Nursing, 10, 323–328. Browne, M. ve Cudeck, R (1993). Alternative Ways of Assessing Model Fit. In K. A. Bollen and J. S. Long (Eds. ), Testing Structural Equation Models (pp. 136-162). Beverly Hills, CA: Sage. Chin, W. W., Gopal, A. ve Salisbury, W. D. (1997). Advancing the Theory of Adaptive Structuration: The Development of a Scale to Measure Faithfulness of Appropriation. Information Systems Research, 8(4), 342-367. Decker, W. H. (1987). Managerial Humor and Subordinate Satisfaction. Social Behavior and Personality: An International Journal, 15(2), 221–224. Doosje, S., De Goede, M., Van Doornen, L. ve Golstein, J. (2010). Measurement of Occupational Humorous Coping. Humor, 23(3), 275–305. Freud, S. (1960). Jokes and Their Relation to the Unconscious (J. Strachey, Trans.). New York: W.W. Norton. Original work published 1905. Gross, J. J. (1999). Emotion Regulation: Past, Present, Future. Cognition & Emotion, 13, 551-573. Gross, J. J. (2001). Emotion Regulation in Adulthood: Timing is Everything. Current Direction in Psychological Science, 10, 214-219. Hobbes, T. (1968). Leviathan. Harmondsworth, UK: Penguin. Original work published 1651. Hu, L. ve Bentler, P. M. (1999). Cutoff Criteria For Fit Indices in Covariance Structural Analysis: Conventional Criteria Versus New Alternatives. Structural Equation Modeling, 6, 1-55. Kant, I. (1951). Critique of judgement (J.H. Bernard, Trans.). New York: Hafner Publication. Kline, R. B. (1998). Principles and Practices of Structural Equation Modeling. New York: Guilford. Wiley. Kuiper, N. A., Martin, R. A. ve Olinger, L. J. (1993). Coping Humor, Stress, and Cognitive Appraisals. Canadian Journal of Behavioural Science, 25, 81–96. Kuiper, N. A., McKenzie, S. D. ve Belanger, K. A. (1995). Cognitive Appraisals and Individual Differences in Sense of Humor: Motivational and Affective Implications. Personality and Individual Differences, 19, 359–372. Lazarus, A. A. (1985). Setting the Record Straight. American Psychologist, 40(12), 1418-1419. Lee, D. R. (2015). The Impact of Leader’s Humor on Employees’ Creativity: The Moderating Role of Trust in Leader. Seoul Journal of Business, 21(1), 59-86. Lefcourt, H. M., Davidson, K., Shepherd, R., Phillips, M., Prkachin, K. ve Mills, D. E. (1995). Perspective-taking Humor: Accounting For Stress Moderation. Journal of Social and Clinical Psychology, 14, 373–391. Lehmann-Willenbrock, N. ve Allen, J. A. (2014). How Fun Are Your Meetings? Investigating The Relationship Between Humor Patterns in Team Interactions and Team Performance. Journal of Applied Psychology, 99(6), 1278-1287. Lyttle, J. (2007). The Judicious Use and Management of Humor in the Workplace. Business Horizons, 50, 239-245. Martin, R. A., Puhlik-Doris, P., Larsen, G., Gray, J. ve Weir, K. (2003). Individual Differences of Uses of Humor and Their Relation to Psychological Well-Being: Development of the Humor Styles Questionnaire. Journal of Research in Personality, 37(1), 48–75. Martin, R. A. (1996). The Situational Humor Response Questionnaire (SHRQ) and Coping Humor Scale (CHS): A Decade of Research Findings. Humor: International Journal of Humor Research, 9(3/4), 251–272. Martin, R. A. ve Lefcourt H. M. (1983). Sense of Humor as a Moderator of the Relation Between Stressors and Moods. Journal of Personality and Social Psychology, 45(6), 1313-1324. Meyer, J. C. (1997). Humor in Member Narratives: Uniting and Dividing at Work. Western Journal of Communication, 61(2), 188–208. Potter, N. N. (2006). What is Manipulative Behavior, Anyway?. Journal of Personality Disorders, 20(2), 139–156. Romero, E. J. ve Cruthirds K. W. (2006). The Use of Humor in the Workplace. Academy of Management Perspectives, 20(2), 58-69. Tucker, R. P., Wingate, L. R., Slish, M. L., O'Keefe, V. M., Cole, A. B. ve Hollingsworth, D. W. (2014). Rumination, Suicidal Ideation, and the Mediating Effect of Self-defeating Humor. Europe's Journal of Psychology, 10(3), 492-504. Vaughan, J., Zeigler-Hill, V. ve Arnau, R. C. (2014). Self-esteem Instability and Humor Styles: Does the Stability of Self-esteem Influence How People Use Humor?. The Journal of Social Psychology 154, 299–310. Wixom, B. H. ve Hugh J. W. (2001). An Empirical Investigation of the Factors Affecting Data Warehousing Success. MIS Quarterly, 17-41. Yerlikaya, E. E. (2003). Mizah Tarzları Ölçeği (Humor Styles Questionnaire) Uyarlama Çalışması. Yayınlanmamış Yüksek Lisans Tezi, Adana: Çukurova Üniversitesi, Sosyal Bilimler Enstitüsü. Yerlikaya, E. E. (2009). Üniversite Öğrencilerinin Mizah Tarzları ile Algılanan Stres, Kaygı ve Depresyon Düzeyleri Arasındaki İlişkinin İncelenmesi. Yayınlanmamış Doktora Tezi, Adana: Çukurova Üniversitesi, Sosyal Bilimler Enstitüsü.